At Home Teeth Whitening Systems for Sensitive Teeth: Does it Work? Your teeth are the very first thing a person will notice about you whether you are smiling or not. Without realizing it, we can judge a person by the colour of their teeth, missing teeth and even the angle of them. While we can’t control genetics, the damage we do to our teeth through eating and drinking can be reversed. Some of our favourite foods and drinks can cause a lot of discolouration to our teeth over time without us noticing. These items include coffee, wine, dark soda, chocolate, candy and berries! I love my coffee and tea so for me removing these items out of my diet would be extremely difficult. In the past, I’ve had Dark Spots on Gums Treatment to cure some dark spots I had on my gums that I thought was a side-effect of coffee and smoking. I have found ways to cut back but eliminating entirely has felt impossible. 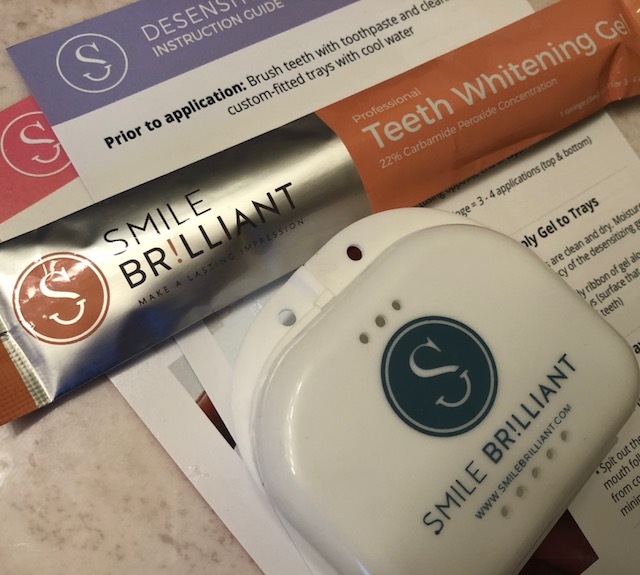 Smile Brilliant is an at home teeth whitening system that allows you to reverse the damage done over time from the comfort of your couch or bed (literally). You can easily spend a lot of money on over the counter products which are not guaranteed to work or in an office where you not only lose time away from work but also have to adjust for the cost of these treatments. Smile Brilliant is an easy to use at home system that is tailored to your teeth! What I loved the most about this system is that you first have to complete your own dental trays. The package comes with enough material that if needed due to an error you make trying to create the impressions, you can always redo your dental trays. The components were easy to mix together (they felt like Playdoh) and easy to place into the trays. Once the trays were ready to insert into your mouth (one at a time) you were sailing. I did find that I produced a lot of saliva at this point, so don’t leave the bathroom when completing this part. My kids had a great laugh as saliva was dripping out of my mouth. 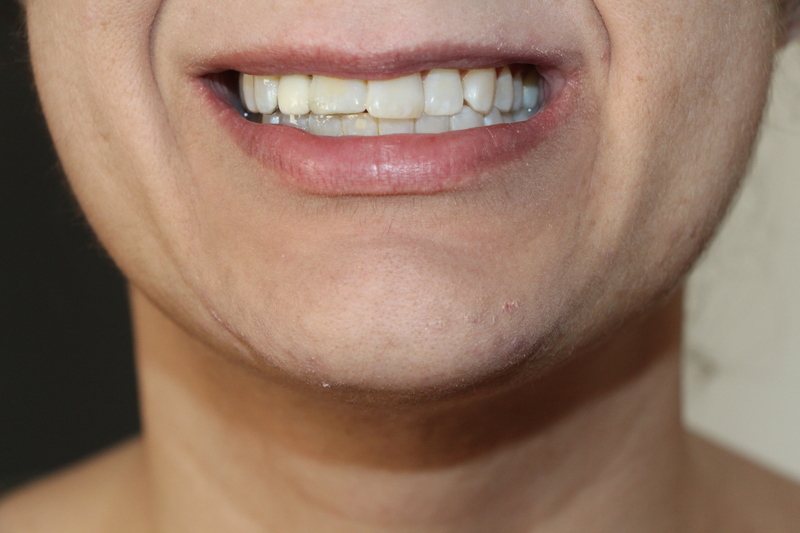 I had this unexplainable fear of my teeth coming out with the trays (I have a fake tooth on a bridge at the front of my mouth) and it did not do any damage at all to my bridge or tooth. Once the trays have been left to harden, your next step is to mail them off. I received my personalized dental trays back within two weeks from the USA. It was pretty neat to see the impressions of my teeth and how well they fit into my mouth. I think that this is the part that makes the biggest difference and sets this system apart – it is fit to your mouth and teeth, leaving no area untouched. The initial package came with the de-sensitizing gels and whitening gels that I would need. Each syringe has enough of the gel to complete 3-4 applications, the syringes looked like they would be awkward to use at first but it was quite simple to open them and apply them to the dental impressions. After that it was just a matter of applying the impressions to my teeth and waiting the recommended time, easy peasey right? The impressions did feel awkward on my teeth the first time I put them in because I wasn’t used to them. After two usages this feeling went away and it was like they were just my own teeth. You can see the stains from the coffee and tea on all my teeth especially the ones in the front. It is one of the few things that I am actually quite self conscious about and it causes me not to smile as often as I would like. I was so impressed with the difference the trays made in just under two weeks. I used them only for thirty to sixty minutes a day for that time frame and after each usage I noticed an improvement. It really helped me with my confidence and smiling more because I was not as self conscious about the colour of my teeth. 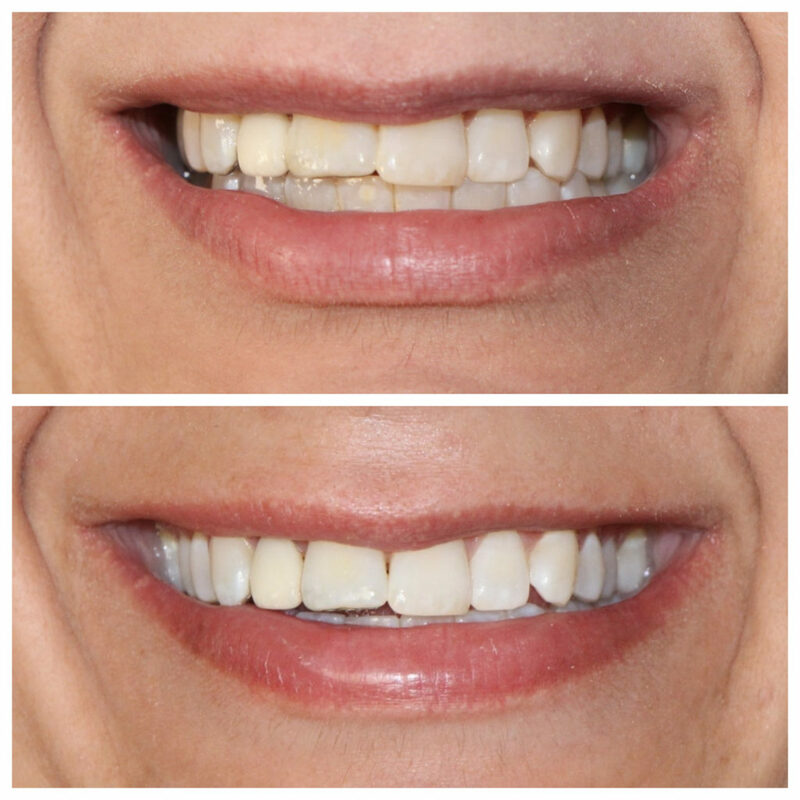 If you don’t like the thought of using teeth whitening kits and would prefer to visit the likes of a Cosmetic Dentist in Vista, CA, then this is still an option. What I would recommend you to do, is see which one suits your lifestyle best before making a quick, uninformed decision. Take your time and I hope you find your happy medium, reaching your goal of sparkly, white teeth! Want to win your own Smile Brilliant Kit? Enter now to win by clicking on the link below which will take you to Smile Brilliant to enter. 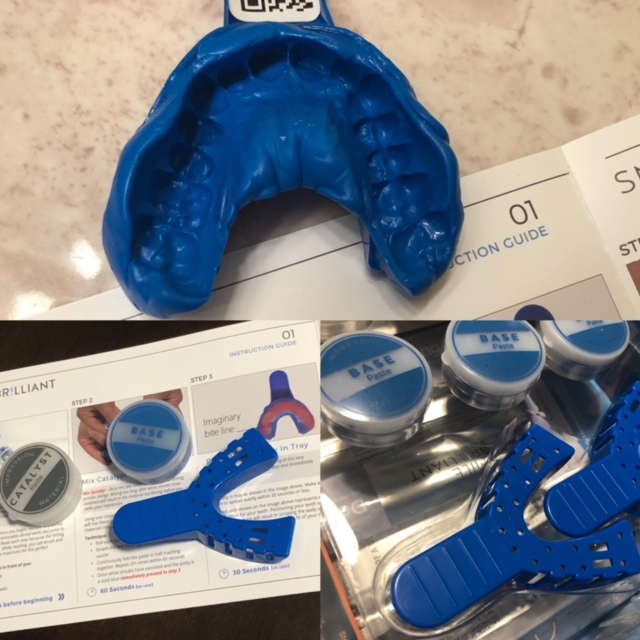 Head over to Smile Brilliant now to learn more about their home teeth whitening system and to order your own. Make sure you are following them on Facebook and Instagram to keep up to date with all the latest news and deals. This entry was posted in giveaway, health and fitness, Lifestyle, review.